Independent Directions to this Site: From Highway 416 take exit 49 (Roger Stevens Drive). If southbound, a 0.4 km offramp dumps onto Bankfield, where you will turn right or southwest. If northbound, the 0.4 km offramp brings you to Bankfield, where you will turn left or southwest onto it and in 0.4 km join the southbound offramp traffic. Both groups will now follow Roger Stevens Drive southwest 18.6 km to the Dywer Hill Road. Turn right or northwest onto it and drive 0.7 km to the pulloff (opposite # 6444) to the right or northeast for the Pine Trail on Dwyer Hill Road. Marlborough Forest Loop Route Directions: From the parking area for Trail 13-6 on Roger Stevens Drive, turn right or southwest onto Roger Stevens Drive and proceed 6.5 km to Dwyer Hill Road Turn right or northwest onto it and drive 0.7 km to the pulloff (opposite # 6444) to the right or northeast for the Pine Trail on Dwyer Hill Road. 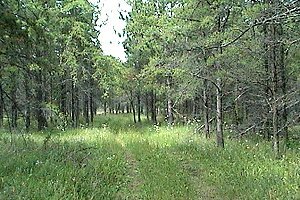 Site Description and Birding Information: This trail leads northeast from Dwyer Hill Road into an area of large, then smaller pine trees. It turns fairly soon to the north, passing through some clearings and mixed forest. It continues northward to skirt a marsh. Ruffed Grouse favour the pine grove in summer. Be sure to check the overgrown farm fields to the west of Dwyer Hill Road near here. It's just the kind of spot a Loggerhead Shrike might turn up, if there were any left around here. Also, parts of the abovementioned marsh can be seen from the road a short distance to the northwest of the pulloff. Marlborough Forest Loop Route Directions: From the pulloff for the Pine Trail on Dwyer Hill Road, return southeast on Dwyer Hill Road the 0.7 km to Roger Stevens Drive. Turn right or southwest onto it and drive 2.6 km to the turnoff to the right or straight to the Montague Boundary Road in 150 metres, while Roger Stevens bears left. Turn right or northwest onto the Montague Boundary Road and drive 0.2 km to William Campbell Road. Turn left or southwest onto it and enter the next site in our loop, the William Campbell Road.